The European Union is drawing up new proposals to offer to Iran to get it to halt its nuclear programme. The package, believed to include freer trade and political incentives, is to be discussed by permanent UN Security Council members and Germany next week. Iran responded by insisting that it had a "right" to nuclear technology. Tehran has dismissed Western concerns, saying its nuclear programme is entirely peaceful, and has rejected calls to stop uranium enrichment. President Mahmoud Ahmadinejad said there was no need for anyone to be nervous about the programme. "All of them know 100% that the nuclear programme in Iran is totally peaceful," he said at the Developing Eight summit of Muslim nations in Bali, Indonesia. Mr Ahmadinejad repeated that Iran was ready to hold dialogue with any country except Israel but not with "bombs over our heads". "If they want to resort to the use of force we will not go into dialogue with them," he said. The EU has not given details of the new offer to Iran being considered, but diplomats describe it as a mixture of "the carrot and the stick". BBC world affairs correspondent Jonathan Charles says Iran will be encouraged to import the fuel it needs for its civil nuclear power stations, rather than producing its own. The aim is to persuade Iran to halt uranium enrichment. In return, the European Union would offer freer trade as well as political guarantees and technological incentives. "The EU would be prepared to support Iran's development of a safe, sustainable and proliferation-proof civilian nuclear programme if international concerns were fully addressed," says a draft EU statement obtained by Reuters news agency. The package would expand on an offer made last August, which Iran rejected. Our correspondent says it is a measure of the West's desperation that it has had to resort to such an offer. The chances of getting tougher wording on a UN resolution to threaten Iran appear slim, he adds. Both China and Russia, which are veto-holding members of the Security Council, do not want to support any move which might open the door to military action. The United States, Russia, China, Britain and France plus Germany are to meet in London next Friday. Meanwhile Iranian Foreign Minister Manouchehr Mottaki said in Bali that any proposal that did not include Iran's right to nuclear technology would not be acceptable. "No incentive can be interesting for the Iranian government and the Iranian nation unless it includes Iran's right to benefit from peaceful nuclear technology." On Friday UN Secretary General Kofi Annan urged the US to hold direct talks with Iran to try to break the stalemate. "I think it is important that the United States come to the table and that they should join all the European countries and Iran to find a solution," he said. Washington, however, rejected the suggestion. US Ambassador to the UN John Bolton said: "This is not a bilateral issue between the US and Iran. It is an issue between Iran and the world." Also on Friday, EU diplomats said UN inspectors had found traces of highly enriched uranium at the Lavizan-Shian research site, which Iran dismantled in 2004. However the diplomats said the results still had to be confirmed and one source close to the International Atomic Energy Agency said the enrichment level was below that needed to make nuclear warheads. 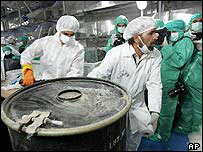 Iran denied any illicit activity took place at the site.